A Chef in Thyme... | Follow me on my culinary adventure! Follow me on my culinary adventure! Summertime. Everything’s better in the summer – the days get longer, the air gets warmer, people are more relaxed, and you get more food posts from me! I have neglected to post to say the least. The last post was in September….of last year. It’s been a hectic senior year between applying to colleges, applying for scholarships, long hours of studying, working, compiling a yearbook, and other fun stuff. Now it’s time to relax and do my two favorite things, cook and write! I will be graduating in three days! How exciting is that?! I will be attending Winthrop University in Rock Hill, South Carolina. Here’s where you’re going to ask me “What are you majoring in?”. Oh well that’s a funny question, because you see, I have ABSOLUTELY no idea and it scares me. I’m going to just go with the flow, take some classes, like everyone says and figure it out somehow. All the jobs I want are undependable and with today’s economy, I can’t afford to do that, well my parents won’t allow it. Honestly, I’ve thought about being a screen writer for movies, an author, a psychiatrist, a criminal profiler (not quite like you see in Criminal Minds) and anything else I find interesting. I don’t know, I guess I’ll know when I know, but for now I don’t know. Thanks for putting up with my random tangents and a post with no picture. I promise next time I post, it will be something yummy that you’ll want to make! See ya next time and don’t forget to subscribe if you haven’t already! Life. Is. Stressful. Between SAT studying, which is October 6th, being an editor for yearbook with deadlines looming ahead, and a paper due for my college english class, life is busy this weekend. So of course I have to take time and wind down. 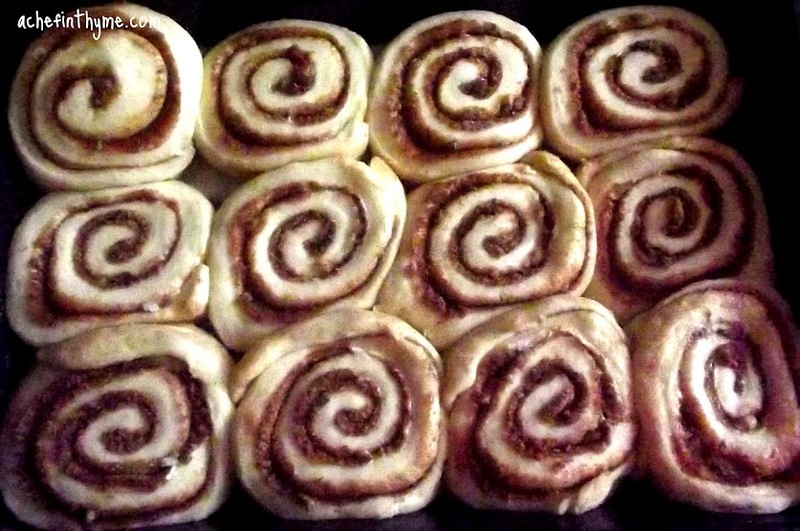 So I bake! And y’all get to see the results and make it for yourself! 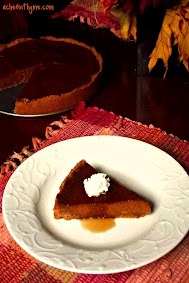 The requisite holiday pumpkin pie takes on a sophisticated look in the form of a tart. Make sure to use pumpkin puree, not pumpkin pie filling. Tart may be frozen, tightly covered, then thawed in the refrigerator prior to serving. 1. Preheat oven to 350 degrees F. Butter a 9-inch pie pan or a 9- to 9 1/2-inch tart pan with a removable bottom. 2. Prepare crust. In a large mixing bowl, use an electric mixer to beat butter, brown sugar, cinnamon, and vanilla on medium speed until blended and smooth, about 1 minute. Sift together flour, cornstarch, and salt and add to bowl. 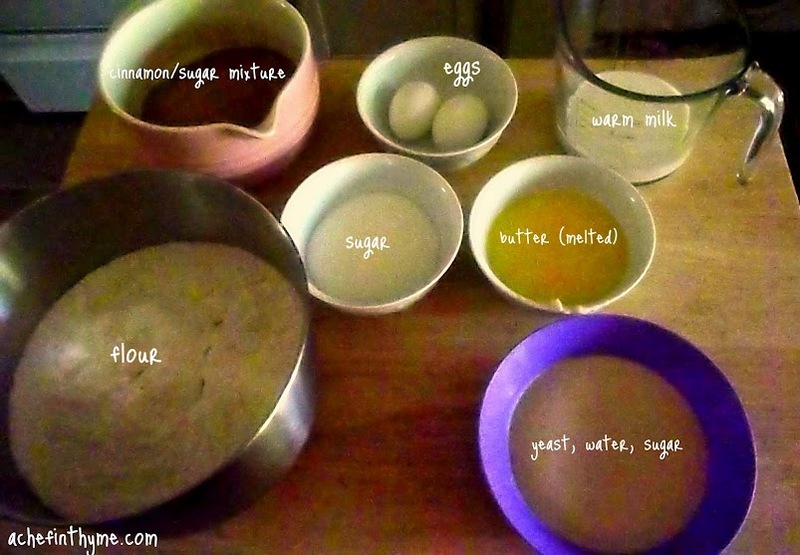 Mix on low speed just until dough forms crumbs and flour is blended, about 15 seconds. 3. Transfer crumbs to prepared pan. 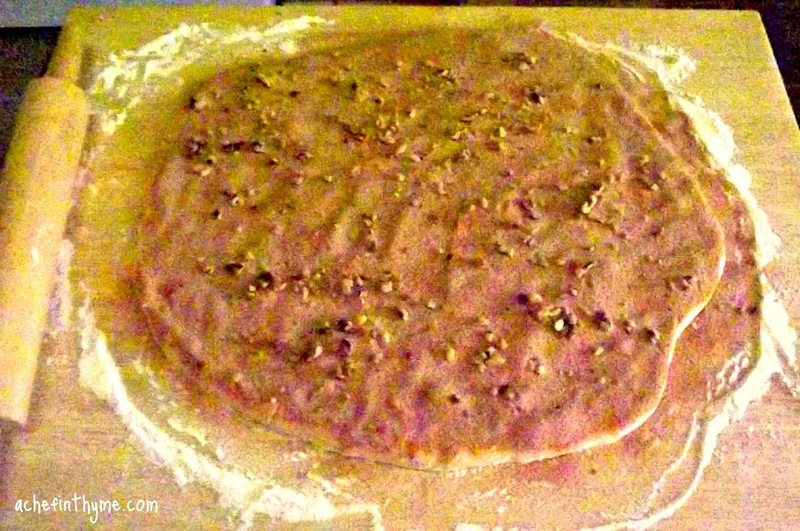 With clean dry hands, press dough smoothly and evenly onto bottom and sides of pan. Using a fork, prick top of dough lightly. 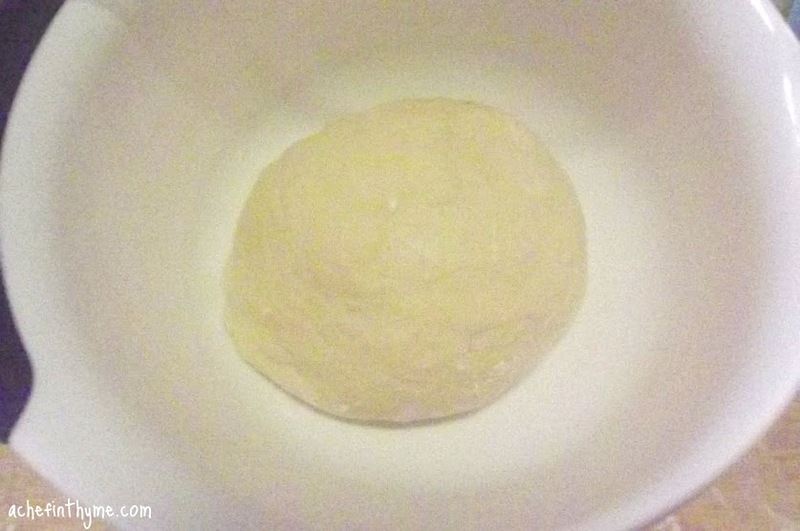 Bake crust 15 to 18 minutes, until firm and lightly colored; edges should not begin to brown. Let crust cool for 20 minutes before filling. Lower oven temperature to 325 degrees F.
4. Make filling. In a large bowl, whisk eggs, brown sugar and maple syrup, until smooth. Add cream, cinnamon, ginger, cloves, and salt, whisking just to incorporate. Use a whisk to blend pumpkin in thoroughly. Pour into partially baked crust. 5. Bake tart until filling is just set in center and edges are firm, about 52 to 57 minutes. Transfer to rack; cool completely, about 2 hours. Refrigerate until thoroughly chilled, at least 2 hours up to overnight. To serve, carefully slide a small knife around edges of crust to loosen it. Serve chilled or at room temperature, topping each slice with a drizzle of maple syrup and a spoonful of whipped cream, if desired. It’s finally starting to “cool” down here in South Carolina which means it is 75 degrees instead of 85. But hey, I think it feels great! And when it gets down to 75 here, I know fall is on its way. Sure, the leaves don’t change color until December and don’t fall until February but we are on our way…which means it’s time for fall foods! 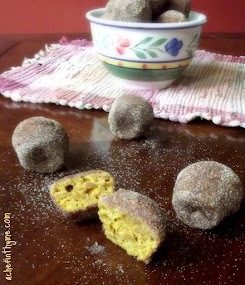 Drum roll please…Baked Pumpkin Spice Doughnuts! Don’t worry – you don’t actually use the whole stick of butter for the coating, it just makes it easier to dip the muffins. 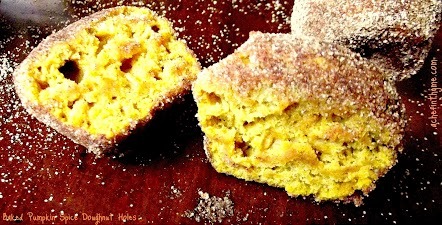 If you’re looking for a somewhat lighter treat, skip the coating – the muffins are moist and pumpkin packed all on their own. These are best dipped and coated the same day you are going to eat them, otherwise the coating tends to get soggy. This recipe is a must-make! Absolutely delicious! Approximately 5 cups all-purpose flour, sifted plus more for kneading/floured surface. It will be about twice the size after 1 hour. Now it’s your turn to go make them! You’ll be happy you did! This past weekend has been a dream. I have been surrounded by fabulous food made by Chuck, a family friend. 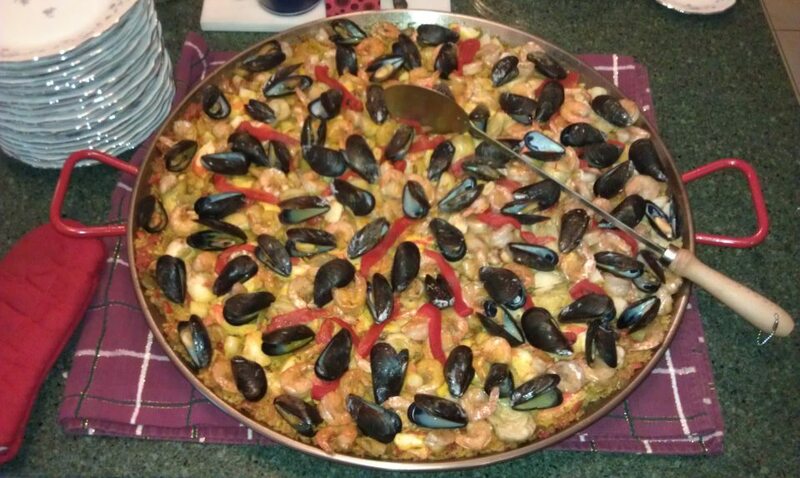 Some of the food he made included paella, upside down breakfast cake, small red potatoes with garlic aioli, all different types of cheeses, sausages and prosciutto, and chorizo diablo. Mmmmm, Chuck you are one FABULOUS cook! The dream gets better too! Chuck was very kind and gave me two of his treasured cookbooks; “Julia Child and Company” and “Larousse Gastronomique”. (Gasp!) According to Chuck because I have only heard the name of “Larousse Gastronomique”, it has everything you would ever need to know about cooking. And Julia Child, who doesn’t love her?! I was searching through antique shops and estate sales for the longest time to find just one of her cookbooks and was never successful. But now I have two awesome cookbooks on the classics of cooking, thank you Chuck! The following day my mom’s friend Heather joined us and we got on the topic of KitchenAids and how I was saving money for one. 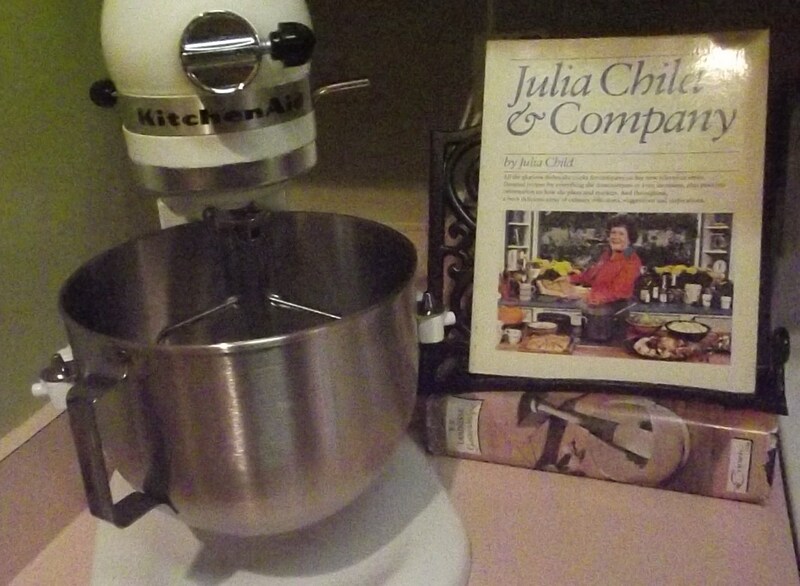 Heather had a 4 1/2 quart KitchenAid that had never been used and she gave it to me! (Gasp!) I was one happy camper this weekend! It looks like I have a lot of cooking and baking to do for Heather and Chuck. Thank you so much Chuck, Heather, and even George, you don’t even know how happy you’ve made me! I thought I would share this picture, it will give you a good laugh. 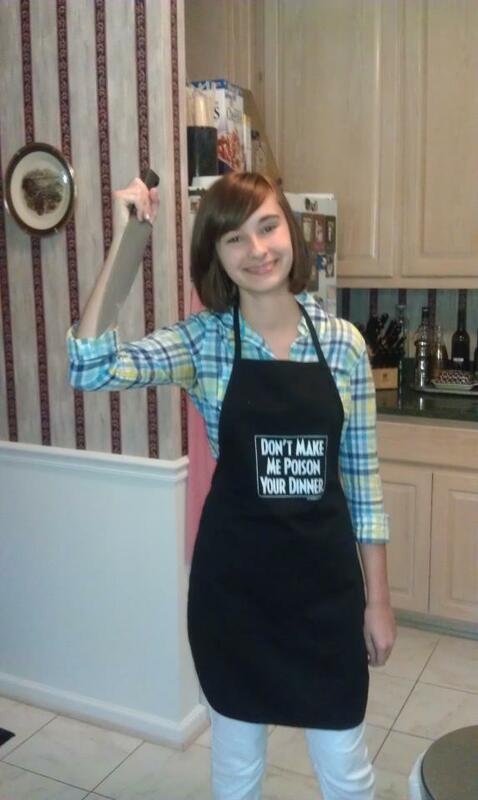 The apron says, “Don’t make me poison your food!” and I am holding a 12 inch knife. I have always had a passion for food and photography. I recently discovered that cooking and baking will just be a hobby for me and not a career. Those of you who have been following me for awhile know that I was pretty set on going to Johnson and Wales for a baking and pastry degree. I have always been interested in pyschology and the way the mind works but I don’t exactly want to be someone’s “shrink”. I really like being in the action of things and using critical thinking. I also like figuring out why people do things that they do. So I researched some pyschology related jobs and came up with an FBI profiler. I know, WAY different than making cupcakes. Have you ever seen the X-Files? It was in season back in the early 90’s. I obviously didn’t watch it because I wasn’t even born yet, but back in tenth grade I got hooked on the show. I love it and it has always been my favorite show since. (I am actually watching the shows a second time recently) Anyways, I have always dreamed about working for the FBI because the X-Files glorified it and made it look like they had a new case out of the office everyday. But I definitely could see myself studying the minds of criminals and the crime committed to try and figure out who the criminal is. Back to the original topic, I’ve thought about it a lot in the past month and what the future would hold for me and it isn’t what I would like to do day in and day out. 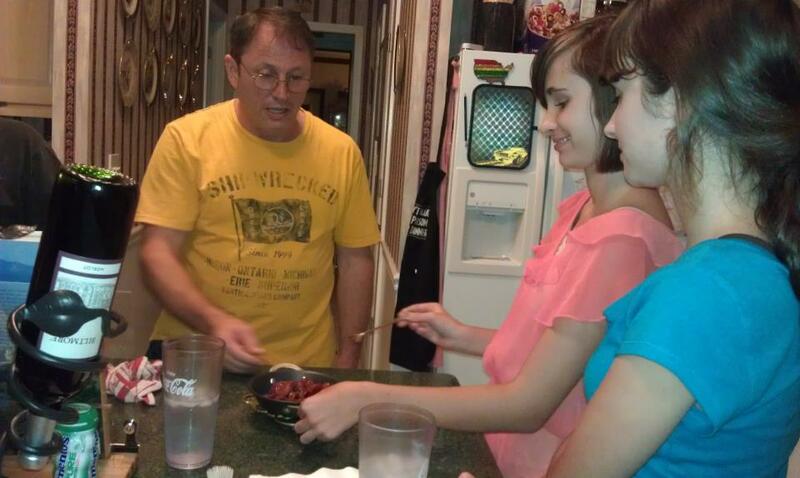 On the positive side, I will continue my blog and facebook page because I do love to cook and bake. 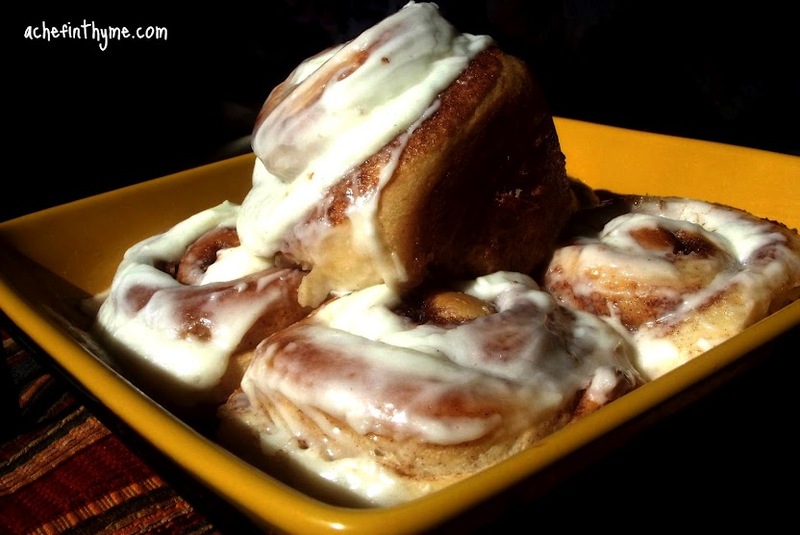 You can follow me to see me experiment with new recipes or post on my old favorites. 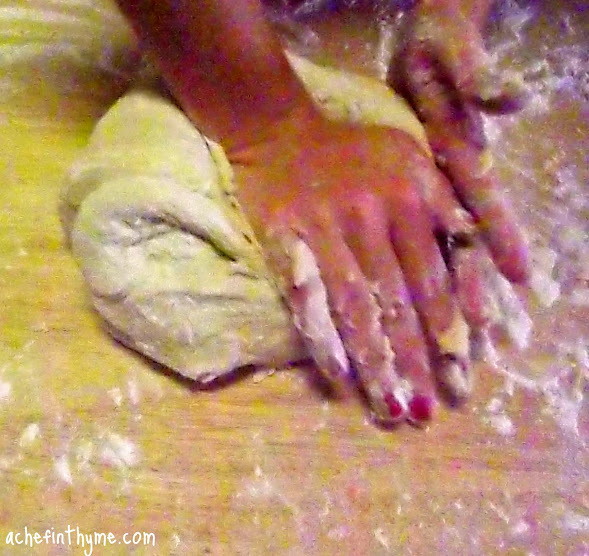 If you have a favorite recipe you’d like to share and have me post on, leave a comment below or email me at: achefinthyme@gmail.com. I would love to hear your feedback (including constructive criticism) so I can improve. Thank you to all of my followers and if you are just visiting to see what my blog is about, I would love to have you along on my culinary adventure! As most of you know, I sell cupcakes and 10% goes to Daisy’s Place Retriever Rescue. I donate to Daisy’s Place because Number One: I love animals and Two: I have a Lab myself from their rescue named Murphy. He is a sweet 9 year old black lab. They are a small rescue for older dogs and have recently had some sick Labbys. One of them is one of my foster dogs, Iris who recently had a cancerous tumor removed from her hind leg. That surgery cost approximately $900 and with other sick dogs’ surgeries and treatments, they are in a tough situation. The costs of the surgeries and treatments have been very high, so they are doing all they can to fundraise. They have created a bake/cook sale auction. I offered two of my items to the bake sale, my pecan pie cupcakes and my applesauce spice muffins. Please visit their auction site on September 24th to make your bid if you live in the local Charleston area to help the rescue and the sweet labbys. It is only a 24 hour auction, so bid quickly to win your item! I will have the auction site posted as soon as I get the information.